Set in a spectacular location, Over Brandelhow is a semi detached cottage and sits on the slopes of Catbells facing south, with wonderful views over Derwentwater and down the beautiful Borrowdale Valley. Natural materials have been used wherever possible, ash and slate floors and solid oak doors. There is an abundance of birds and wildlife to watch, red squirrels and woodpeckers are regular visitors to the garden along with the pheasants and numerous woodland birds. From the cottage there is direct access onto Catbells. A beautiful stroll down through Manesty Woods to Brandelhow brings you to the lake, from here you can take the ferry to Lodore or Keswick. The Allerdale Ramble runs across the fell behind the cottage and takes you either to Grange or Portinscale. the situation is perfect for magnificent walks either around the lake, over Catbells to Newlands or down the Borrowdale Valley towards Honister Pass. The cottage which sleeps up to six people in 3 bedrooms offers the following accommodation: one double bedroom with direct access to the family bathroom (bath and separate shower cubicle) along with another double bedroom (which can be made into a twin upon request) on the ground floor. 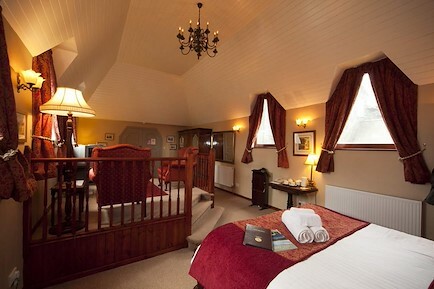 Upstairs there is another twin bedroom with a fully fitted en-suite shower room. Dogs are welcome to come along too! There's also a very spacious sitting room with a solid ash floor and an electric woodburning stove effect fire opening onto a well equipped newly fitted handmade oak kitchen with Lakeland slate worktops, oven, microwave and large fridge feezer along with a large oak table that seats 6. This is a really sociable space, solid wood floors and large sofas with Patio doors that open onto a large lakeland slate terrace with table and chairs offering fantastic views down the Borrowdale Valley. The cottage is heated via a very environmentally friendly air source heat pump, this helps cut greenhouse gas emissions and keeps the air in Borrowdale as fresh as it should be ! All heating and electricity,bed linen and towels is included so no additional costs to worry about. Over Brandelhow is Non Smoking. The picturesque village of Grange is about 1 mile away and Keswick approximately 5 miles, thats about a 15 minute drive around the lake. Boats can be launched onto the lake at Kettlewell or at the Marina in Portinscale. The cottage is very spacious and easily accomodates a family or group of friends. Dogs are more than welcome at an additional charge of £20.00/week. There is also private parking. Relax on the terrace and admire the view in tranquil settings or hike the fells, its all there right on the doorstep! Come and get away from it all, its a great spot ! NB BOOKINGS MADE VIA A 3RD PARTY (IE NOT DIRECTLY WITH OURSELVES) WILL INCUR AN ADDITIONAL 10% CHARGE. Please ensure that you read our Terms and Conditions prior to placing a booking. Over Brandelhow is located on the slopes of Catbells, Manesty at the top of a private drive approximately 1 mile from Grange in Borrowdale and about 5 miles from Keswick. The postcode, should you wish to look up the location online is CA12 5UG. Your enquiry will be sent directly to Over Brandelhow. Please fill in as much detail as you can.